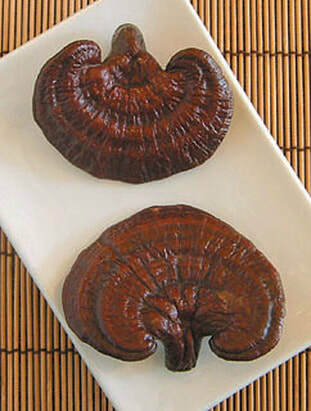 Reishi (Ganoderma Lucidum) is a reddish brown, kidney shaped, woody textured mushroom native to Asia. Reishi is known as The Mushroom of Immortality it is one of the most legendary of fungi associated with royalty, health, recuperation and longevity. It is often depicted in ancient paintings and tapestries with emperors and sages. Reishi and other mushrooms have been used in Asia for centuries as foods and for medicinal purposes. Mushrooms are the above ground, spore producing, fruiting bodies of fungi. Immunity enhancing – enabling and strengthening the body’s immune response to diseases like cancer, viruses and infections. Inhibits histamine release – useful for allergies especially respiratory and skin reactions. Histamine is a chemical present in cells throughout the body that is released during an allergic reaction. Histamine causes itching, sneezing, swelling and airway restriction. Enhanced lung function - useful for high altitude travel and performance, reduces altitude stress/sickness by enhancing the oxygen absorbing capacity of the alveoli in the lungs. Additionally, Reishi has expectorant and anti-tussive properties. It has proven to be useful in the treatment of heaves (COPD) asthma and bronchitis. Antioxidant and Geriatric Care – useful for reducing damage from free radicals and oxidative stress related to aging. Free radicals are produced within our bodies during everyday metabolic processes. They damage cell structures and DNA. They are normally balanced by antioxidants. Anti-tumor – Polysaccharides in Reishi stimulate the body’s natural killer cells (NK cells), and activate macrophage activity making it a useful treatment tool against tumors. Natural killer cells, a type of white blood cell and part of our immune system, contain enzymes which target and kill tumor cells. Macrophages, the body’s garbage cleansers, engulf and destroy foreign materials. With this impressive resume, it is easy to understand how this modest fungi has come to be known as The Mushroom of Immortality! Reishi is now cultivated world-wide, it is easy to locate and is quite affordable. Medicinal mushrooms are easily taken as a tincture, in capsules or in teas. One to two teaspoons per day is usually adequate for the average 1,000 pound horse. Many very good quality blends are now available to consumers through Chinese herbalists, health food stores, and via the internet. I always advise people seek out preservative free and organic herbal products whenever possible. Chinese herbal supplements should be used properly and thoughtfully under the guidance of a licensed Chinese herbalist. Traditional Chinese Medicine (TCM), used properly is an adjunctive therapy, complementary to veterinary treatment. Information presented here is not intended to replace proper veterinary diagnosis or treatment and should not be used for that purpose.